The drum pump motor JP-164 is a compactly built, not explosion-proof, internally ventilated universal motor, that has proven itself for slightly viscous media as diesel in agricultural field and at fire brigades foaming agents. 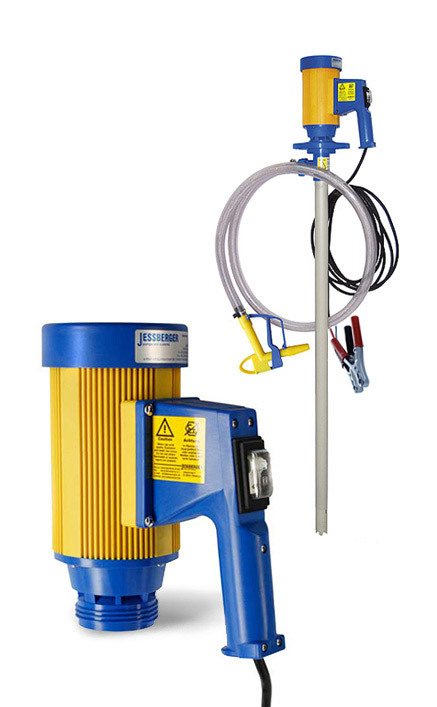 This handy, very robust and powerful engine can be used as a 24 Volt engine for the suction tubes of drum pumps and is in this combination suitable for many thin fluid and slightly viscous, neutral, aggressive and non-flammable liquids (max 300 mPas). Its sophisticated, technically clear structure ensures an efficient and safe use when transferring the wide range of media. The drum pump motor is characterized not only by its light weight (2,9 kg) but also by its elegant design and ease of use. The non-stationary and stationary usable drive is particularly suitable for intermittent operation. As internally ventilated motor it has an optimal air cooling, low noise and ensures high operational safety and long lifetime. An overload circuit breaker prevents overloading of the drum pump motor. The motor is supplied at the end of the 5 meter cable as standard with two battery poles. For use by firefighters, police or army a 2-pole plug in screw connection according to DIN 14690 can be mounted alternatively. 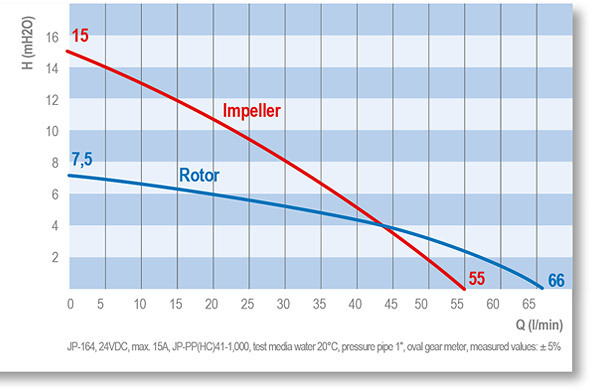 The maximum density of the media is for the JP-164 universal motor 1.3, the maximum viscosity 300 mPas. 24 Volt DC, 400 Watt, IP 24, double insulated protection class II, overload protection, 5 m cable with battery clamps.